Revue FH : Fusion Display Case: a new way of displaying a timepiece. The new Dietlin cabinets are designed to give a new lease of life to the display cabinet. 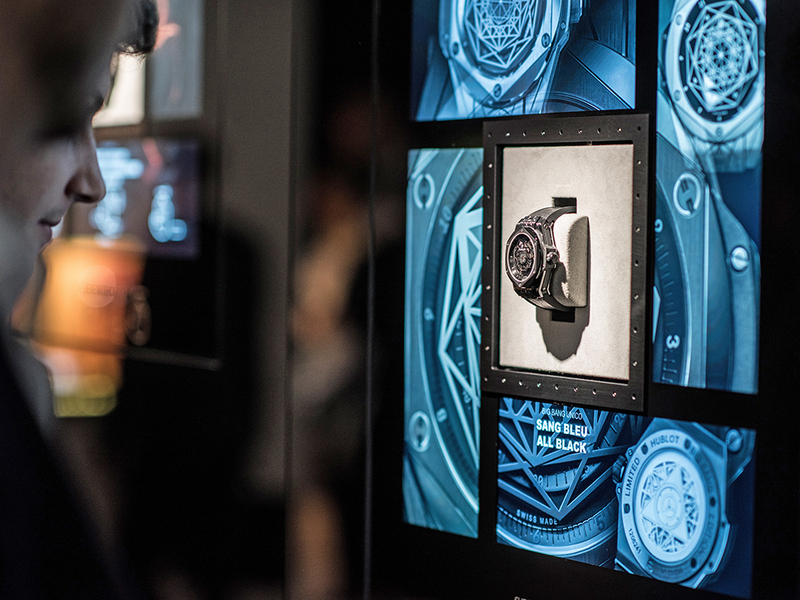 The « phygital», name chosen to denote the use of digital systems in conjunction with physical access to the products is increasingly used for watch presentation units on exhibition stands and also in retail outlets. Clients who are particularly keen on this new way of showing a timepiece appreciate the opportunity to approach the product very closely, view it without an intervening pane of glass, obtain information about the characteristics of the watch on screens and even try it out immediately. 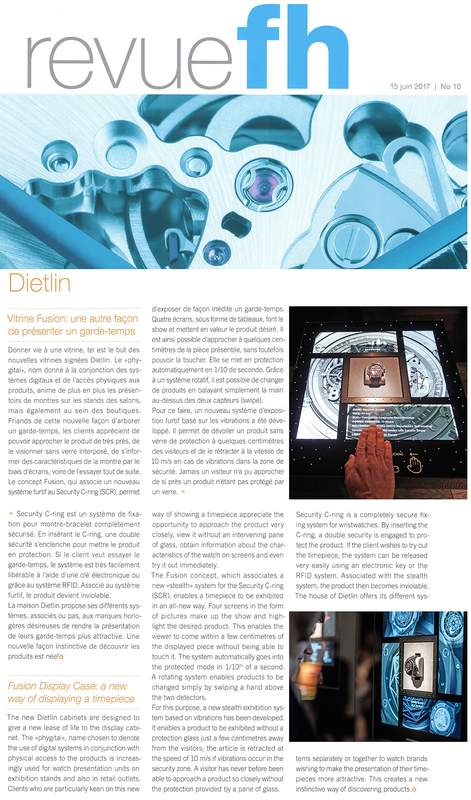 The Fusion concept, which associates a new «stealth» system for the Security C-ring (SCR), enables a timepiece to be exhibited in an all-new way. Four screens in the form of pictures make up the show and highlight the desired product. This enables the viewer to come within a few centimetres of the displayed piece without being able to touch it. The system automatically goes into the protected mode in 1/10”" of a second. A rotating system enables products to be changed simply by swiping a hand above the two detectors. For this purpose, a new stealth exhibition system based on vibrations has been developed. It enables a product to be exhibited without a protection glass just a few centimetres away from the visitors; the article is retracted at the speed of 10 m/s if vibrations occur in the security zone. A visitor has never before been able to approach a product so closely without the protection provided by a pane of glass. Security C-ring is a completely secure fixing system for Wristwatches. By inserting the C-ring, a double security is engaged to protect the product. lfthe client wishes to try out the timepiece, the system can be released very easily using an electronic key or the RFID system. Associated with the stealth system, the product then becomes inviolable. The house of Dietlin offers its different systems separately or together to watch brands wishing to make the presentation of their timepieces more attractive. This creates a new instinctive way of discovering products !